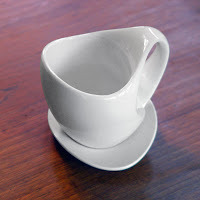 The undulating rim fits the lips better and prevents spills on the side opposite the handle. How can you not love a mug with that description? It is also lead-free, microwave and dishwasher safe, and the saucers double as lids for space saving stacking.